WILSON -- Wilson Fire Company #1 proudly advertises their "famous annual Lenten fish fry" on their website and Facebook page. And now they can add "award-winning" to that title. Maybe it's their proximity to water. Maybe it's their familiarity with heat. Or maybe it's the social media campaign that pushed them over the top. 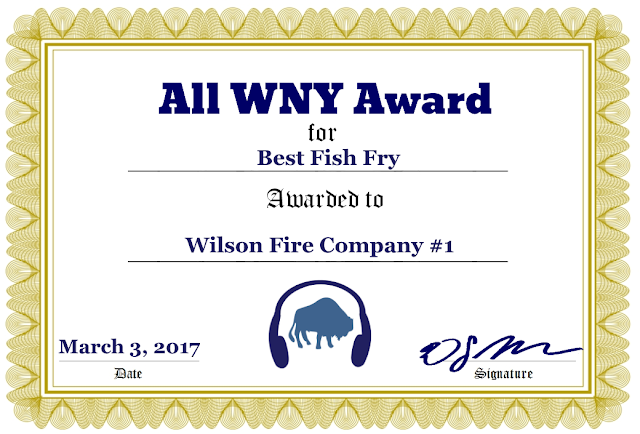 For one reason (or many), Wilson Fire Company #1 was the clear favorite of voters in the Best Fish Fry category for the All WNY Awards. Served by the fire company's Ladies Auxiliary, their annual treats start tonight and run through Good Friday. For their victory, they not only get the title, but free advertising on All WNY News & Radio. The next All WNY Awards category nominations start right away: Best Reuben.